Hello everyone; I’m back for part two of my blog post! I hope that you enjoyed the previous post about using the library resources when conducting research for a marketing project at Saint Joseph’s. Some would argue that conducting research is the boring part of a project (I am, on occasion, one of those people). However, me and my group-mates conducted research for a good reason because we then had to create a video on Millennials to share the information that we found. In the video, we discussed the demographics, geographics, and behavioral patterns of Millennials among other things. 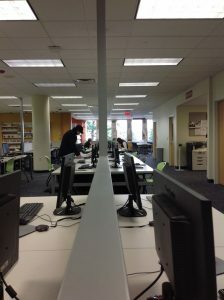 Once again, the library played a big role in helping us complete our project on time! Me and my group members are all very busy Saint Joseph’s students. Some of us play varsity sports, some play club sports, and some participate in clubs. To make things even more hectic, we all live in different places on campus. Needless to say, finding a time where we could all get together and work on our project was difficult. However, by using the library, we were able to complete our project early and submit it after fall break. tables on the second floor) of the library and the new side (once again, at the tables on the second floor) of the library when we met to discuss our project. Both times we met we originally planned to meet on the first floor PLC. However, we could never get a table here because they are in high demand. this made it very easy for all of us to work together even if we were not on campus. Working at the library made it much easier for my group to complete our project because we were all able to work together on the project at the same time and place. Using the library resources made it easier for us to complete our project more efficiently. Without the library, our project would have been much more difficult! 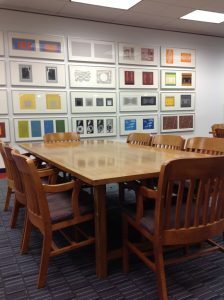 Previous PostA Student’s View of the Library – Part INext PostCampus Coffee Hour — Faith Justice Institute!